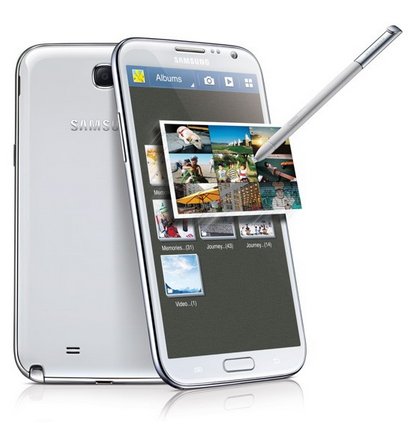 Ever thought the Galaxy Note II’s 5.5-inch screen is just a little too cramped, or maybe small for that matter? You may be in luck, especially if you’ve got hands the size of bigfoot! Samsung announced its new Galaxy S4 yesterday, but that hasn’t stopped the rumors flying about another of the company’s well received smartphone lines. The Galaxy Note collection of smartphones, or phablets as some like to call them, blur the lines between smartphone and tablet by featuring large, vibrant screens and coming equipped with a stylus. The currently shipping model, the Note II, uses a mammoth 5.5-inch display, but if the eagle-eyed amongst us are right, then this may soon be dwarfed by an even larger model. When announcing the fourth generation Galaxy S phone, Samsung also launched a mico-site to go along with it. One of the items shown off on that micro-site is a Bluetooth game controller that, according to the blurb, supports handsets as large as 6.3-inches. Yes, that’s the same size of a display which has been making rounds earlier, and reported to land on the Note 3. Now admittedly, this may just be Samsung future-proofing its accessories, but the current rumor on the block is that the next Galaxy Note may upping the stakes by going as large as 6.3-inches. That’s a lot of phone for one device alone. In fact, we’re willing to argue that it’s just too big, way too big in fact, especially if you’ve not got the largest of hands or, just as importantly, pockets. The Galaxy Note has proven to be incredibly popular in the US, UK and Asia, but we fear something so large may alienate that fanbase a little too much. Previous rumors coming out of Korea have already suggested that a 6.3-inch Note is on the horizon, and the latest news just goes to add credence to that. It would certainly help to differentiate the Galaxy S and Note lineup further, but at what cost? As for the Bluetooth gaming controller that started all this off: it actually looks pretty good, though we’d have to get our hands on one before getting too excited. 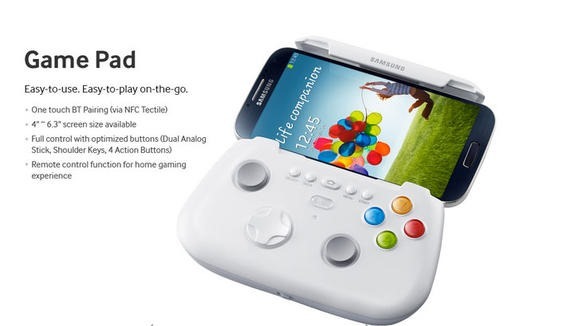 Here’s hoping for some awesome Galaxy S4 accessories, too.